A network of veins, ponds, ferns, a system of gray stills saturated with a reddish glow in which, like a rainbow...suddenly appeared the Angel. Asymptote reviews two new publications—a collection of short stories and a novel—by Roger Lewinter, born in 1941 in Montauban, France. 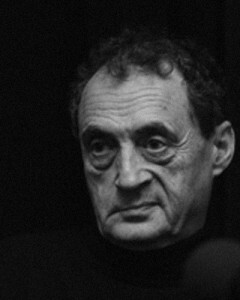 The author currently lives in Switzerland and has worked as a writer, editor, and translator. These are two of his three works of fiction to date, and their publication with New Directions is Lewinter’s first appearance in English, in translations by Rachel Careau. New Directions certainly lives up to their name with this exciting new foray into the work of a long neglected French author. 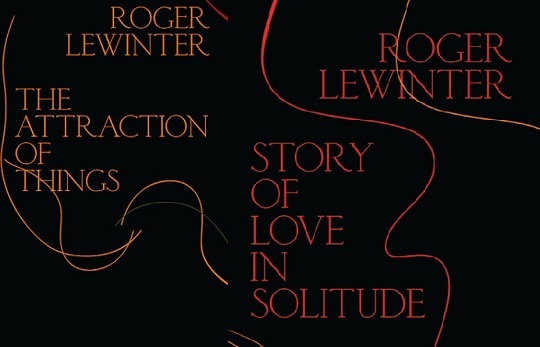 Story of Love in Solitude marks the first translation of Roger Lewinter into English. Lorenzo Valentin has compared Lewinter’s writing to “a Kashmir shawl in its infinite interlacing, woven in one piece and from a single thread” and the description is apt. The continual lacing of Lewinter’s prose is a beguiling process; it may confuse and frustrate, but in its complexity it also points to beauty. This short but sweet collection combines three of Lewinter’s tales, ‘Story of Love in Solitude’, of the title, ‘Passion’, and ‘Nameless’. Intriguingly, rather than a facing-page translation, the publishers have decided to starkly separate the translation and its original counterpart in the book. This makes cross-referencing a lot more of a challenge, but equally forces the reader to take time with the translations and appreciate them as independent from their origin. The first, and most lyrically titled of the three, begins with an all-too familiar scenario—spotting a spider before heading to bed. Except this occurrence becomes a sinister loop. The next night, another appears and the pattern continues. The scenario is episodic, a simple commentary in which the brevity of the encounters is such that they hardly have room to develop before being suddenly cut off. This cyclic repetition reappears in the second and longest tale, which grapples with a more extensive narrative of recovery in the aftermath of the death of the narrator’s mother. The narrator seeks solace in the delivery of a camellia, and the promise of life that plants bring during a time of mourning: ‘one must devote one’s thoughts to a plant for it to thrive, I had concentrated, so that they grew to the point of becoming’. However, like the spiders of the first tale, in this episode we are again faced with creatures that come to invade and infringe upon the life of the narrator. Soon he begins to spot the first signs of death working its way into the plants: ‘depression hollowed out in the deep green thickness’, the leaves ‘reduced to a network of veins’. The story itself is rich with the keen perceptions and terminology of a botanist: ‘corolla’, ‘calyx’, ‘stamens’. Scientific terms pepper the text with insightful and illuminating usage and create poetic images that powerfully linger: ‘the lower petals atrophied like a ruff’. The life cycles of man, plant, maggot, moth, all converge in this tale. Time passes and life and death rear their heads again and again in a variety of forms. With the stories just a few pages each, it’s easy to see why critics have often struggled to classify Lewinter’s work. Though generally termed short stories, these could just as easily drift gently into long prose poems or flash fiction. The brevity and intensity of the tales are their defining features, and the narrative arches and spirals the cement that keeps the book together. In the last and most poignant of the tales, ‘Nameless’, the use of dashes becomes reminiscent of Emily Dickinson’s poetry. Lewinter’s lines stretch and contort, shifting the focus to individual words and phrases with a poetic hand: ‘–the thunder-stroke of joy–’, ‘–purity, a matter of a movement of exact madness, depending on that instant–’. His use of punctuation throughout the collection is notable, as is Rachel Careau’s in her wonderful translation, both creating a force that draws a reader to and fro with unfailing power. In ‘Nameless’, we are finally introduced to a narrative that involves more than one character. The interplay between the narrator and a nameless man on whom he spies from a distance at a market becomes the crux of the episode. The narrator, like an author, is able to observe from a position of safe remove and control—apart from the person he views and yet openly a part (however distant) of this person’s life. The narrator, like Lewinter himself, is a writer and translator, and his precarious mental state is reflected in his interactions with the man at the market stand. When he is given a book he begins to see his own life mirroring art—the tale of a character he reads strikingly similar to his own. Fate becomes a physical and influencing hand: ‘a force beyond my control gripping the nape of my neck had made me move away without a word’, maintaining the natural tendency of the observer to be fascinated without daring to approach, but to puncture ‘the solitude in which he seemed to move’. Again circularity becomes key, the strange infatuation of pure and platonic love becomes a cyclical act. To simply observe a man at a market stand and enjoy his life as it is without openly interacting or engaging with it presents ‘the open possibility of love a loop without end’, where the speaker is able to savor the brief encounters of transactional utility that bind them together at the market. Lewinter perfectly captures the strangeness of infatuation and the way in which it becomes all too easy to project one’s own narrative onto the bodies of those around us. This collection ends with frustration, a hanging colon, a piece of punctuation that calls out for more, that radiates with suspense and the suggestion of what is to come next. Lewinter gives nothing away; leaving his reader at this cliff-edge, he retreats. He causes a reflection and suspension that may not be to every reader’s taste but intrigues nonetheless. More importantly the action calls into question the boundaries of such stories. Where does fiction end? Can there ever be a true ending? Lewinter’s answer is clear—the question itself is enough. Roger Lewinter’s The Attraction of Things is about things and a person’s attraction to them. But after finishing the book I keep misremembering the title as The Attraction of Things Past. In my mind that “past” aspect is inseparable from the other elements of the narrative and plays a key role in the book because the narrator is as much obsessed with the past as with the matter. He chases objects that once upon a time belonged to people who had to let them go, due to death or financial or emotional necessity. The things survive and find their way to flea markets. “…while that evening, going to bed after the lotus, just before midnight I sank into an unconsciousness from which the telephone pulled me: On Wednesday, March 23, at 1:05, had come death. “On Saturday, April 23, I went to the flea market, telling myself that what I would find would be my father’s sign…” (75-56). In telling this character’s story, Lewinter’s writing takes us on a stroll through a flea market of its own. His sentences are long and winding, full of phrases and clauses, moving in and out, back and forth, between stalls and spreads, from past to present. (The complexity of these chains of words makes one wonder how translator Rachel Careau found her way around, aiming for the same style in the target language.) It takes some patience to walk with Lewinter through these passages, but if you do stay with him, you might arrive at that gem you have been looking for, or one that you weren’t even aware you needed. Thea Hawlin (Ha-V-lin) is a writer, artist, and social media manager at Asymptote. After graduating from the University of Cambridge in English Literature and running away to Italy she has gone on to write for a variety of publications, including AnOther, VICE, Harper’s Bazaar, and the Times Literary Supplement. Her most recent fiction can be found in the forthcoming Next Review. Poupeh Missaghi is a writer, English-Persian translator, and Asymptote‘s Editor-at-Large for Iran. A recent Ph.D. graduate from the University of Denver’s Creative Writing Program, she has published both fiction and non-fiction work in Entropy, The Brooklyn Rail, the Feminist Wire, World Literature Today, Guernica, Quarterly Conversation, and elsewhere. I have the impression that book reviews are heavily tied to NDbooks. That’s coincidental ?